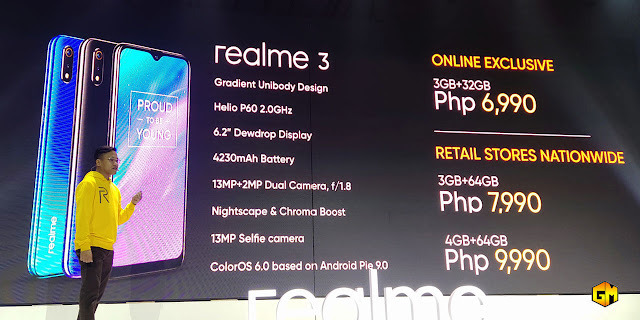 Home / launching / realme / sale / shopee / smartphone / Realme 3 launch in the Philippines. Available dates and Price | Gizmo Manila. Realme 3 launch in the Philippines. Available dates and Price | Gizmo Manila. Early this week, Realme unveils its newest smartphone that can change the landscape of smartphones in the Philippine market, The Realme 3. The Realme is the company's mid-range smartphone that can match or even one step ahead against the other brands. The Realme 3 features a 6.2-inch Dewdrop display powered by MediaTek Helio P60 12nm Processor. On of the advantage of the Realme 3 is its camera features. With its 13MP+2MP Dual Camera allows you to take stunning photos weather you are in day or night time with the help of Chroma Boost and Nightscape mode. The Realme 3 price-range is quite good for its specs. It matches the price range of the typical local brand phones in the country today. The Realme 3 will be available starting March 25. The Realme 3 (3GB/32GB) variant will be exclusively available online via Shopee. While the Realme 3 (3GB/64GB) (4GB/64GB) will be available starting March 30.